terms will be used in other bargello patterns. A Bargello quilt is arranged in rows and columns of rectangular fabric cells. All the rows have the same width, but the columns have different widths. In most parts of a Bargello pattern, the fabric colours of the cells are arranged so that the colour of a particular cell is the same as the colour of the cell in the adjacent column either one row above, or one row below so that you could trace diagonally through the pattern, finding the same colour in each new cell. Usually, the colours in a column are arranged to sweep steadily from one colour to another quite different colour. The combination of sweeping colours and varying column widths gives a bargello quilt its characteristic sweeping curving colour patterns. A strip of fabric with width equal to the Row width + ½” (to allow for two seams) and length at least 20.5″. 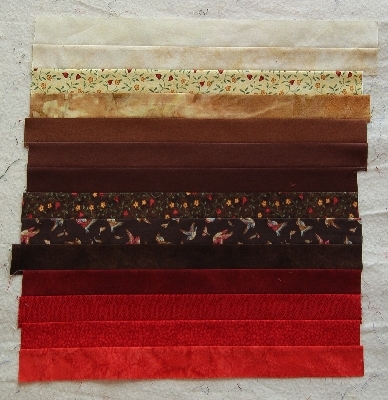 A set of strips sewn together, most often with one strip from each of your fabrics. The strip sets are organised within your pattern to give the least number of unpickings, and may not be in the original order. About half the strip sets will be pressed upwards, and about half pressed downwards. The particular sequence of colours used in a specific strip set. 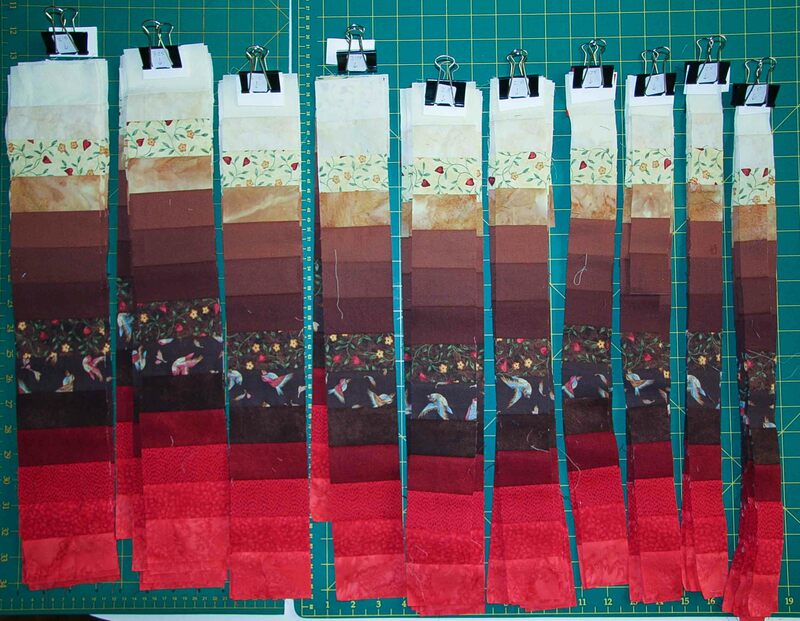 After the strip sets are sewn, they are cut into columns of specific widths. Part of the column of a block or strip set.